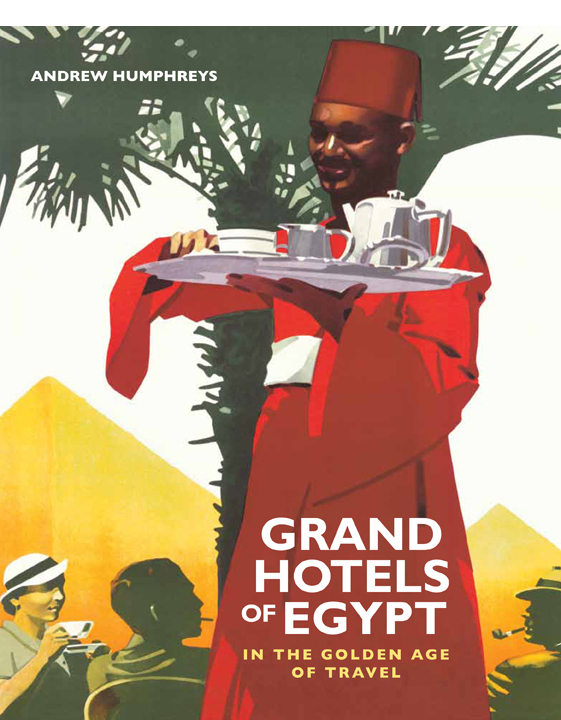 I am currently reading and thoroughly enjoying your book The Grand Hotels of Egypt and am very much looking forward to your book on Nile Steamers. As you know of course, the building you mention in the photograph above is still the British Ambassador’s residence (it was the embassy in the past) The embassy itself is just around the corner at 7 Ahmed Ragheb Street. I used to visit the residence fairly regularly seven or eight years ago. I have one question that I need help with, if you don’t mind me asking.. I know the Thomas Cook Nile steamers used to leave from a wharf at the southern tip of Gezira island. Were they able to get under the Abbas II bridge after it was built (in 1906, I think) and if not did Cook’s have to set up a new wharf? 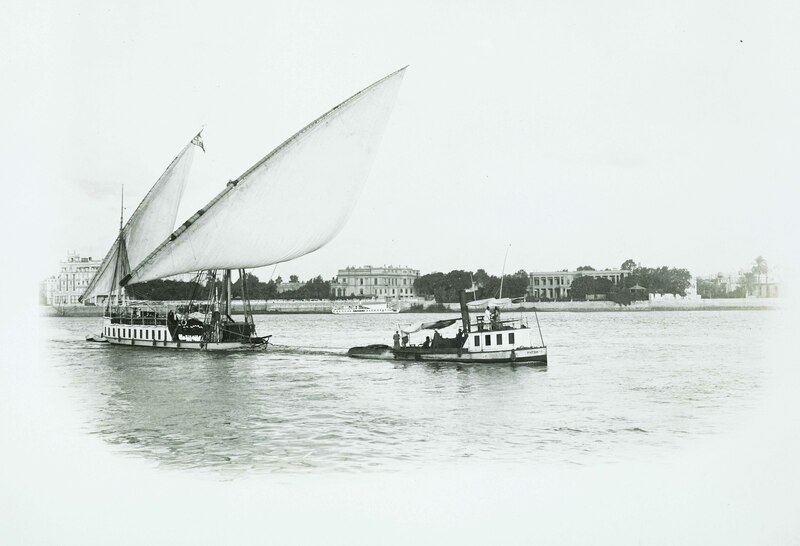 Stephen, Cook’s steamers were still mooring at the dedicated landing on the east bank of the Nile near the Semiramis well after the Abbas Bridge was built, so they must have been able to pass beneath it. Excellent thanks for that. Can’t wait for the next book! If you don’t understand French, just translate it online. I used a translation software that comes with my computer. I lived in Cairo from 1978-1981. My husband was a commercial secretary at the British Embassy, so I know the Residence and the Embassy well. 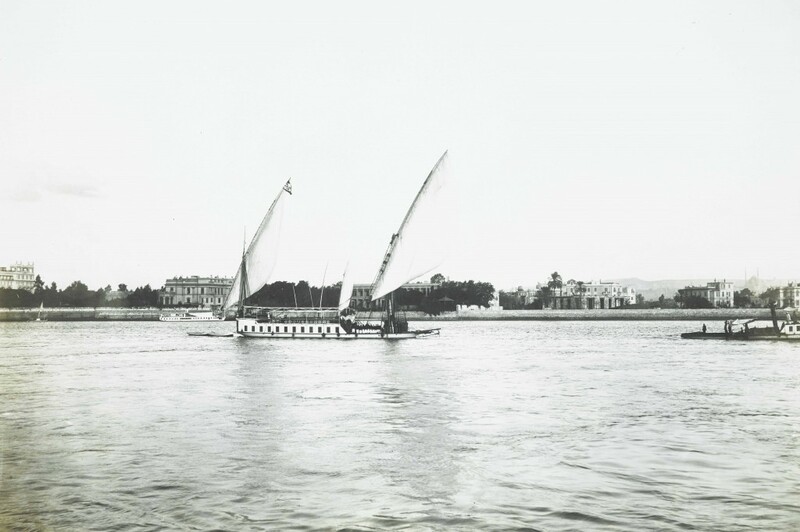 In 1889 the old palace grounds of Kasr al-Doubara that ran between Kasr al-Ali and the east bank of the Nile, were divided into streets and plots, and the palaces torn down. Lord Cromer persuaded Whitehall to purchased one of the properties. The house became the new British Agency, as this was how the old Agency on Adly Street (formerly Magrabi) had been known. 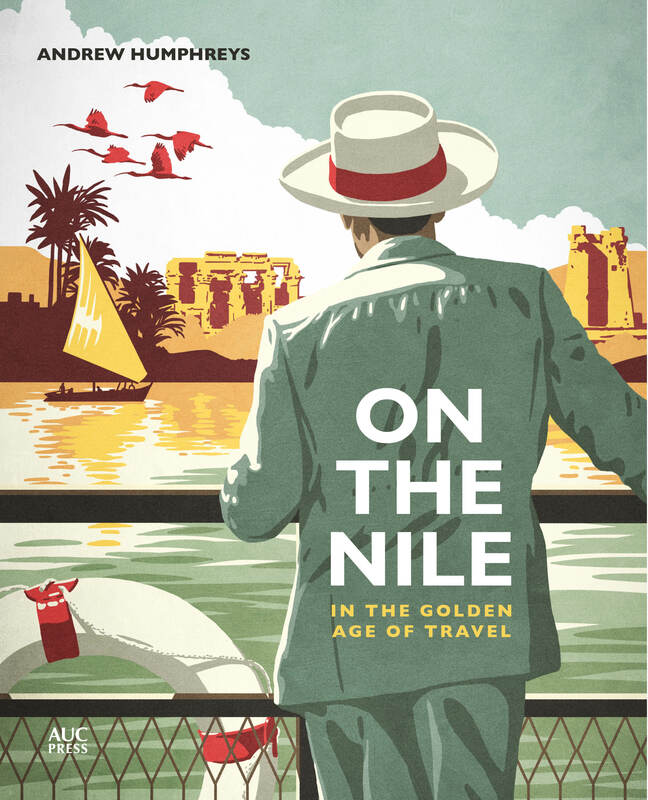 At that time the garden ran down to the Nile where beyond the wall, Thomas Cook’s boats were moored.To the north of the Agency was Kasr al-Shoobra, where the Pasha’s brother, Sultan Hussien Kamal had lived. It eventually became the Semiramis Hotel, (which I saw in 1976 when it had been nearly totally been demolished). 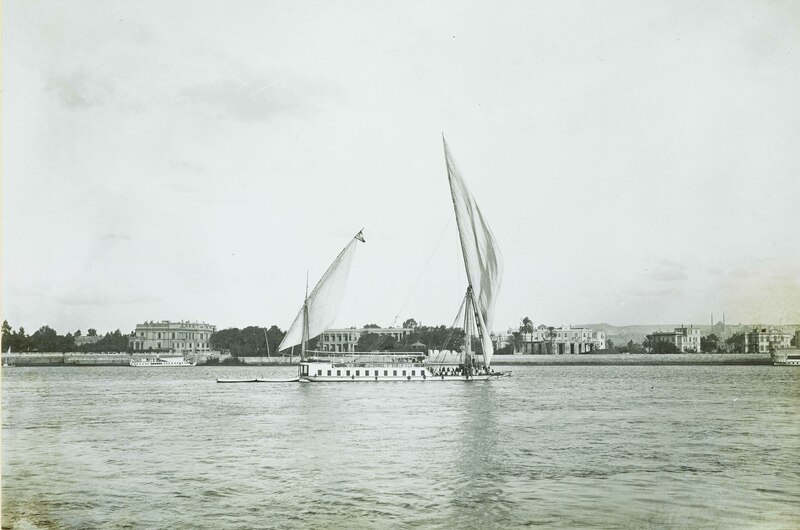 A second palace to the south was Kasr al-Walda, where the Khedive’s mother (Ismail’s grandmother) lived, and on the bank of the Nile, Kasr al Doubbara, the residence of Ibrahim Pasha. The Agency was often referred to as Bayt Al Kurd (the Lord’s House), in reference to Lord Cromer. The crescent-shaped Chancery entered through guarded gates by way of Ahmed Rageb Street came much later, about the same time as the new Shepheard’s Hotel a block away. Six high-rise buildings were also built in the space occupying the demolished Doubara palace. When the British Agency became known as the British Embassy in 1936, the daily business of Her Majesty’s government was dealt with at the new crescent-shaped Chancery building joined between the garden of the Residence. The smaller, flat roofed structure to the left, and a little behind the Residence (seen from the aerial photo) became the Visa Section. It has now been reinstated as the original grand ballroom that was built by Lord Kitchener in 1912-13. It boasts the only sprung dance floor in Africa. In 1954 the Egyptian government built a new road between Maadi and al-Madabegh Station; straight through the bottom of the Residency’s garden. I enjoyed you book, Grand Hotels, immensely, and look forward to your second. The building in the middle is Qasr Dubbarah, the house of Princess Princess Emina Naguiba Elhami (1858-1931), the wife of Khedive Mohammad Tewfik Pasha (1852-1892) and Khedive Abbas Hilmi II’s mother. She was known as well as “The Khediva Mother” and “The Benefactors Mother” (Om al-Mohsenin). The Palace was pulled down a couple of years after her death in 1931. It was replaced by several buildings: the Shepheard’s Hotel, al-Shams, François Tagger and 2 other buildings (Isis and Osiris) on Latin America Street. This was a Cairo of 1 million people before all those ugly concrete buildings and the huge influx of peasents from the country side..